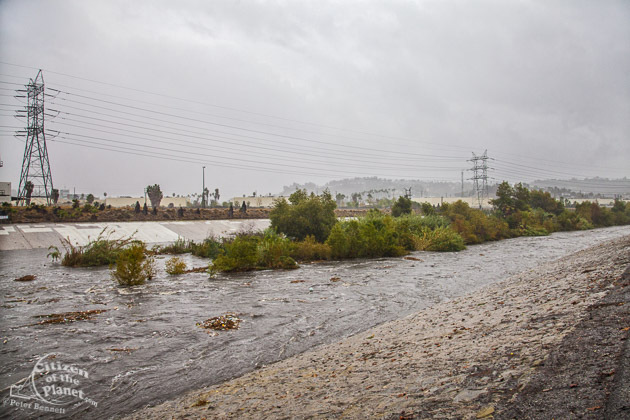 I never get tired of seeing how mightily the LA River rises after a significant rainstorm and so Tuesday I ventured out to see just how the river had risen. First stop was the Elysian Valley, an area that was hit very hard back in the 1930’s when floodwaters overflowed the riverbanks and washed away houses and lives. I stopped at Marsh Park and immediately saw the water was high and was rushing down each side of the concreted banks. Normally along this stretch the river criss-crosses from bank to bank, but when it overflows the small islands and land strips down it s center, it does what a river does and goes full bore over as much geography as it can. The first thing you notice is the trash – beds, basketballs, plastic bags and a ton of Styrofoam cups bob up and down as the river surges downstream. All this trash comes from the streets, gets swept up by the rain and is flushed down the drain pipes and carried to the river where it either gets caught by a wide boom at Long Beach or, as is mostly the case, travels out to sea – pollutants, toxins and all. A testimony to the strength of the river’s force was evident where a pretty large swell had formed next to the Frank Romero mural just upstream from the Confluence. Water churned violently and all those warnings came to mind about keeping one’s distance from the current lest you end up being dragged downstream along with the Styrofoam cups and other flotsam. The Buena Vista Bridge has a pointed base that always reminds me of the bow of an old battleship, even more so when tons of water surges past it. One of my favorite bridges along the river! Lastly a shot from the 7th Street Bridge looking at the soon to be demolished 6th Street Bridge finished my day. Soggy and tired I looked down into the channel and wondered about all the homeless folks I have encountered down below and along the Glendale Narrows on drier days. A transient life and a dangerous one as well! You cannot stand on the banks of the river on a day like this and not wonder how we can let all this water just run out to sea. In a time of such severe drought it is painful to see such waste. Some of the plans for the river’s revitalization will address this with added wetlands and more permeable surfaces to allow the water to percolate back to the aquifer, but after a heavy rain there is dramatic increase of water and only a small amount will go down to the water table, most of it, trash and all, will still continue to rush out to sea. I just read we are still a long way off from actually being able to capture this water for our use, water that could be used for irrigation, cleaning, lawn watering and numerous other uses. Right now we import all our water from the north and east, potable water that we waste on non-potable uses. Really a shame! Shooting Tips: Shooting in the rain is a pain, no way around it, especially with all the electronics making up the modern camera? I rigged up a zip lock bag with a hole for the lens and a tiny opening for the viewfinder. This at least keeps the body dry. They sell various camera raincoats, but I have yet to try one. I tried a small umbrella while shooting but it was useless, so I dragged out my beach umbrella and that did a fantastic job of keeping me and the camera dry. Hate to think about what I looked like walking across downtown bridges with my colorful gigantic beach umbrella but maybe I provided a nice photographic moment for someone else. Keeping the lens dry is the toughest part, even with an umbrella, so carry plenty of wipes for the lens and a cloth or bandana for the body.